It seems like we've been hyping up the prospect of solar powered smartwatches for years but until now, we haven't seen any come to fruition. Citizen was rumoured to be launching one late last year and Vector, prior to being snapped up by Fitbit to help build its Ionic smartwatch, was apparently working on a solar-powered timepiece as well. 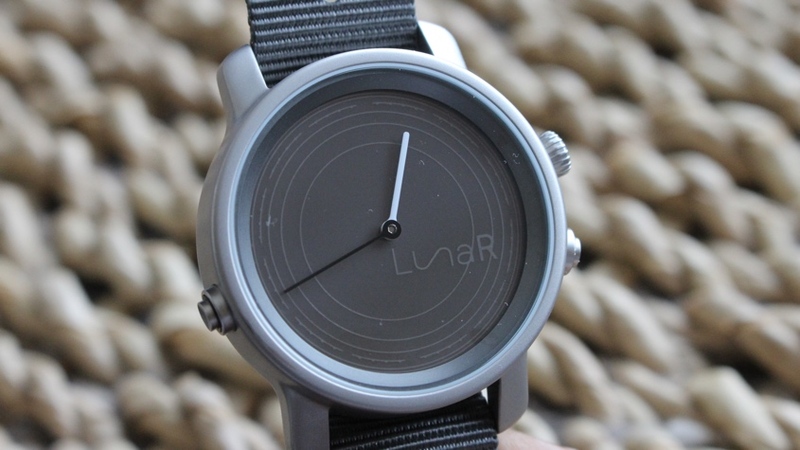 US based startup LunaR is ready to make it a reality and has just hit Kickstarter chasing $50,000 to bring to life what it says is the world's first solar powered smartwatch. The hybrid features a transparent solar panel that is able to harvest light from the sun as well as artificial light to keep it powered. It does come with a charger as well as back up, but if you stay in the light, you should have no need for it. LunaR's key smartwatch features include delivering light-based notifications for texts, calls, and social media updates while it also doubles as a fitness tracker to monitor step counts, distance, calories and sleep. You can track sunrise and sunset times via the panel and it'll even send an alert when you should get outside and recharge. Backers can pick one up for $99, which is somewhat cheaper than the $239 retail price. We've been fortunate enough to get our hands on a working prototype to see if the Lunar delivers on its solar power promise. While LunaR says this is a prototype, the design feels very much like the finished article and right now, it's in very good shape. Like a lot of hybrid smartwatches, the challenge is to strike a balance between producing a good looking watch while dealing with the design compromises that come with adding in the tech to power the smarts. We're big fans of the minimalist approach, from the matte finish on the metal casing and the buttons to the sun-themed watch face and black and white hands. It's simple, stylish and crucially, not chunky. It's a little thicker than an Apple Watch Series 3, but you are not really going to notice that extra weight when it's on. We're not the biggest fans of the strap that comes bundled with the watch, but it's pretty easy to swap it out for something more attractive. On top of the sharp style, it's always a bonus to find out a smartwatch is waterproof and the LunaR able to survive in water up to 50 metres deep. Unlike many hybrids, this one is based on mechanical movement so you will need to twist the crown to set the time as opposed to syncing it with the time on your phone. Aside from the crown there are two additional buttons, which are assigned to check in on activity tracking progress and indicate the digital time. There's not a single fitness sensor in sight, so don't expect to measure your heart rate, but it does have the standard motion sensors for counting steps. It also doesn't have NFC to let you pay for things from your wrist. That's not really all that surprising because what LunaR really wants to push is the feature we'll get onto next. Yes, this is a solar powered smartwatch and as we've already mentioned, it can absorb light from the sun when you're outdoors or artificial light through an ultra thin transparent solar panel. Lunar has partnered with Sunpartner Technologies to use its Wysips Reflect tech, a transparent photovoltaic module that also comes in rectangular and square forms and shouldn't impact on the overall design of the smartwatch. That's the same company that Vector was working with when it was exploring boosting the battery life of its smartwatches. How it works is simple. You go out, make sure the watch screen is not hiding beneath your shirt sleeve and it'll start absorbing light to store into the rechargeable battery. You'll need to monitor that light harvesting from the smartphone app (for iOS and Android) where it'll jump into action as soon as sunlight is detected. This sets the small sun icon spinning on the app's dashboard to indicate that it's soaking the light up. LunaR will also record the amount of time spent out in the sun in minutes, along with charging status and battery level. There's not much more to it than that, and well, it appears to absolutely work based on the time we've had with it. We've only had the watch for just over a week and we've not had to think about charging it once. You do have the option to turn on a low battery alert, but it's not been called into action yet. It'll also send out phone notifications when you need to top up. To say this could be a really big deal for hybrid smartwatches and full smartwatches is an understatement. Especially when you can't even see the tech that's making it happen. This is a smartwatch, of course, and LunaR takes a more discreet approach to adding in these features. Like a lot of hybrids, it focuses on notifications and fitness tracking features. The single LED light at the 12 o' clock position illuminates when a notification comes through on your phone. Each supported app is assigned a different colour to help you decide whether it's a notification that you really need to deal with. You do have the option to change the colours that are assigned and it definitely pays to keep active notifications to a minimum otherwise it quickly becomes a headache remembering which colour is assigned to which app. The other core feature is fitness tracking, where the watch will track steps and monitor sleep – although the latter didn't appear to work for us. Again, it's keeping things simple and for a lot of people, steps and sleep data will probably be enough. That data can be reviewed under the Analysis tab in the app, which also plots the time you've spent in the sunshine over the day, week and month. Additional features include setting up alarms, which send a vibrating buzz to the watch, the ability to see sunset and sunrise times at your current location and a Find My Watch mode if it goes walkies. The LunaR smartwatch promised a solution to bad smartwatch battery life and it looks like it's cracked it. At least for hybrid smartwatches. We imagine trying to discreetly hide the same solar powered tech inside an Apple Watch or an Android Wear watch might pose more of a challenge. But the fact we now actually have a working example showcasing the tech means the days of nightly charging and proprietary chargers could really be over. As for LunaR's credentials as a hybrid smartwatch, there's no getting away from the fact that the smarts are pretty basic. If you manage to pick one up for $99, then you're definitely getting good value for money. At $239, you might be expecting a bit more on the connected front. Still, solar powered smartwatches exist and this could well be the first of many.